The Department of Land and Natural Resources small boat ramp at the West Breakwater provides access to to Kahului Harbor and the sea along Maui's north shore. The commercial harbor is used by a wide variety of people for a variety of activities such as fishing, subsistence gathering, outrigger canoe racing and paddling, surfing and stand up boarding, kayaking, jet skis, commercial fishing, fishing tournaments, and recreational boating. The DLNR facility is the only location on the Island of Maui where larger boats can haul out of the water. Additionally, large private boats and some commercial operators can not obtain adequate repair and inspection services and must transit to Oahu or the Island of Hawaii (Kona) to obtain so-called "dry dock" services. This ocean transit is both expensive and places crew and captain at risk should sea's turn rough or inclement weather be encountered. This project sought to remedy the situation by providing a location on the Island of Maui for private and commercial boats to haul out for inspection and repairs, while simultaneously increasing and organizing public and trailer boat parking. 7. 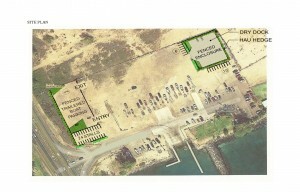 Creates lease revenue to DLNR that could fund other harbor improvements, like portable restrooms.